Italian Prime Minister Enrico Letta rebuked Europe for its handling of the Greek crisis on Monday (29 July), saying the harsh austerity imposed on Athens had deepened the recession and worsened unemployment across the continent. "There is no doubt that serious mistakes were made about Greece by Europe in the past few years," Letta said during a visit to Greece, now in its sixth straight year of recession. "The timing was wrong. The instruments were wrong. The interventions were not made in the right way and at the right time and this worsened the crisis," he said, in one of the strongest official criticisms of the bailout terms set by the European Union, European Central Bank and International Monetary Fund. "The crisis would have been different. It would have created less of a financial disaster, it would have led to fewer job losses across Europe if Europe's attitude to Greece had been different at the beginning," he said at a joint news conference with his Greek counterpart Antonis Samaras. Greece has been at the centre of the eurozone debt crisis since seeking its first rescue package in 2010. Repeated rounds of tax hikes and spending cuts have thrown thousands out of work and fuelled violent demonstrations against the measures demanded as the price for staving off default on its huge public debt. Italy, with a public debt burden second only to Greece's in the eurozone as a proportion of its overall economy, has also suffered severely as successive governments have struggled to get its battered public finances in order. Letta, who has repeatedly urged Europe to emphasise growth and jobs rather than pure budget rigour, said it had to be clear to people in the debt-ridden countries of southern Europe that the sacrifices demanded of them would improve their lives. "These sacrifices are not an end in themselves, they're not the goal, they're the instrument to reach the promised land," he said. 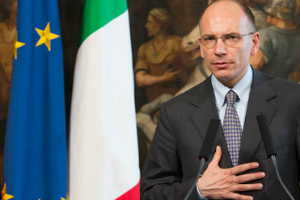 Letta also repeated that Europe risked feeding growing anti-EU sentiment that would become clear in next year's European parliamentary elections. Meanwhile in Berlin, Germany's budget committee did not comment on the payment on the next tranche of aid for Greece by midday on Monday, clearing the way for international lenders to pay out the funds, sources from the committee told Reuters on Monday. As required by law, the German government involved the committee in the decision-making process and gave it the opportunity to comment. The conditions are therefore fulfilled for Germany to give its agreement for the payment of €2.5 billion to recession-struck Greece, the first part of a €6.8-billion tranche of aid. Greece adopted on 25 July the last piece of legislation international lenders required to unlock a total of €5.8 billion in aid from the euro area, its national central banks and the International Monetary Fund. The latest tranche includes €2.5 billion from the eurozone's EFSF rescue fund, €1.5 billion of bond profit returns from eurozone central banks and another €1.8 billion from the IMF. Subject to implementation of further reforms, Athens stands to receive another €1 billion in October. Oh please… successive Italian [and other Eurozone] governments approved of and signed up to all of the European Union Treaties… so the lax enforcement legislation and ill-conceived ‘Euro’ currency and its potential repercussions were well-known to European leaders within the Eurozone. Rather the missing contingency plan was simply ignored and instead the overzealous leaders’ belief that the European Union and the Euro could never fail prevailed. Furthermore, Mario Draghi (another Italian, and ex-Goldman Sachs crony), the current European Central Bank president, was touted for saving the currency with his affirmation that “the ECB would do anything necessary to save the Euro”. A mixture of reality and many European Union member states living way beyond their means provided the backdrop for the perfidious financial markets and government-encouraged rampant globalisation to further speculate on a number of indebted Eurozone economies, i.e. the so-called ‘PIIGS’. So forced austerity has been nothing more than a wake up call to Europeans off all walks that a more circumspect approach to European Union economics would have taken less of a toll on European jobs. … are purely populist and without any proper analysis nor honesty. As so astutely pointed out by former French president and pro-European Unionist, Valéry Gistard d’Estaing, the choice was made when every Eurozone country signed up to a currency whose inception was based on ‘socialised Europe’ not one of pure economic gain.